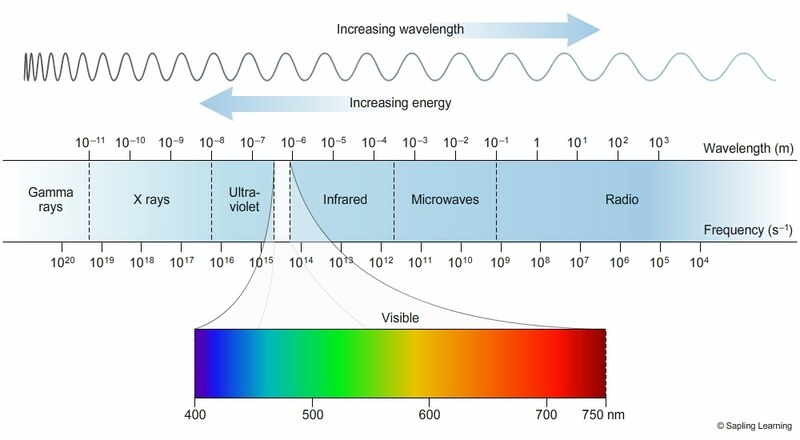 The electromagnetic spectrum encompasses all radiation spanning a range of wavelengths and frequencies. As each radiation has a different set of properties – namely different energy levels- each radiation type can be applied in a different way to enhance our everyday life. Application: Radio waves are used in both radio and TV communications as they can travel extremely long distances. They work by vibrating antenna which is then converted into sound and/or images. While long radio waves bend around the surface of the earth, short radio waves are projected into the sky at an angle and is reflected back to earth upon hitting a layer of the atmosphere called the ionosphere. AM (30m wavelength) & FM (100m wavelength) radio work by combining radio waves with a carrier wave. Radio waves also play a part in wireless internet and mobile phone communication. Figure 3. The electromagnetic spectrum. From EM spectrum, by Macmillan Learning, 2008 (https://sites.google.com/site/chempendix/em-spectrum). Copyright 2008 by Sapling Learning. Application: Microwaves are used in both radar and communication systems utilised by people such as researchers or navy personnel. The most common use for microwaves is to heat and cook food using a metal microwave oven. The metal of the oven constantly reflects short microwaves (0.1mm wavelength) around the inside of the oven allowing them to be absorbed by sugars, water and fats within the food. This in turn causes the particles within the food to vibrate more and heat up. Note that the air surrounding the food, paper, glass and plastics remains unaffected by the microwaves - a plate or container being removed from the microwave may be hot only because the heat from the food has in part been transferred to it.